Besides the rich, savory flavor, what’s really great about avocados is they’re a nutrient dense fruit with lots of unsaturated fats, so they’re really good for you. Our stuffed avocado recipe is perfect if you’re already planning on firing up the grill to cook your favorite steak or seafood, and want a little something different on the side. To prevent sticking and excessive carmelization, just remember to lightly brush your avocado halves with olive oil and keep an eye on them. They only need a few minutes with the fleshy side down on a grill at medium-high heat to get some nice grill marks. 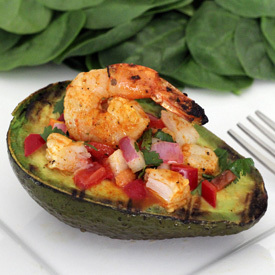 The spicy, cut-up grilled shrimp is the perfect filling for the warm, creamy avocados. Spoon in the salsa, and you’ve really got a party on your plate. Give this one a try! It’s something a little out of the ordinary for the grill master in your family to have some fun with. P.S. A special thanks to Karen at Runner Girl Eats for featuring this recipe on her blog, and to Nicole at Fueling Happy for trying the recipe and posting her own pics! P.P.S. Another big shout out to Paleo Magazine for featuring this recipe in their print edition of Readers’ Favorites Cookbook: Favorite Paleo, Primal and Grain-Free Recipes published in October, 2013. 20 plus medium raw peeled shrimp. I always do extras because everyone loves them! Metal skewers or wooden skewers soaked in water for grilling shrimp. Serve as side dish or appetizer. Either way, its gonna be awesome! Serves 4. Basically 1/2 avocado per person. Feel free to double the recipe for entertaining! Do you add the red pepper with the tomato mix??? Thx! Delightful!!! My husband wanted to know when we’ll have it again! I COULD DEFFINATELY EAT THAT!! Thanks everyone! They are super yummy. I just grill extra shrimp and make a meal out of them!